Yet another challenge submission for my LSS! 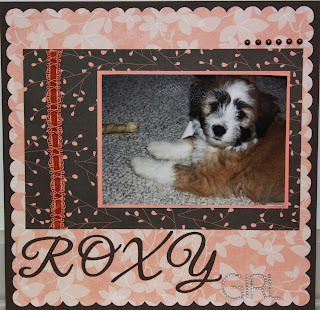 Here is my dog Roxy and she makes for such a good scrapbooking subject....lol. This picture was taken about 4 months ago and she lost all that cute puppy fuzz and has a really long thick coat now. Supplies used: Bazzill cardstock, Bo Bunny Olivia colletion, Quickutz Spicy Chicken die, Kaisercraft gem word, miscellaneous ribbon and pearls.